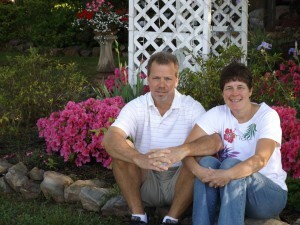 On June 27, 2011 Charlie and Kris Thomas took over as Innkeepers of The Secret Bed and Breakfast. In June of 2010, Kris shut down her mortgage business in which she had been part owner for 10 years. The following February, Charlie was laid off from his job of 22 years as a Golf Pro. With few options in their fields, they decided it was time for a radical change in their lives. A few years back, after staying at a Bed and Breakfast in north Georgia, they had discussed owning one when they retired. Little did they know that retirement would come at the age of 47. It is said that when God closes a door he opens a window. In this case, he opened the window and basically pushed! After looking at several Bed and Breakfasts in the southeast they had almost given up. The places were either too small to profit, did not have enough land to grow, had owner’s quarters that would not accommodate ants, or were located so close to a railroad that the house shook three times a night! Then came The Secret! Upon stepping out of the car, walking into the massive lodge, then seeing the most amazing view, God said “It is done”! The chill bumps are still coming each time Kris shares their story and both she and Charlie look forward to sharing their little piece of heaven with many future guests! So come on up to the mountain and feel the peace and tranquility that everyone deserves at least every once in a while. A Cattle Call??? Yay or Nay? The Weaver Mansion: A Hidden Room?